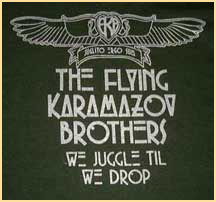 The Flying Karamazov Brothers are a juggling and comedy troupe who have been performing since 1973. They began by busking, but have gone on to perform internationally, including Broadway stages. They describe themselves as a continuing experiment in comedy, theatre, music and, of course, juggling. From the beginning, the goal has been that of blending the worlds of performance art, improvisation, word play, harmony, passion and virtuosity into a unique form of theatre and entertainment. It’s been a while since we’ve been able to present the Ks at the Moisture Festival but … this is that year and we’re thrilled.